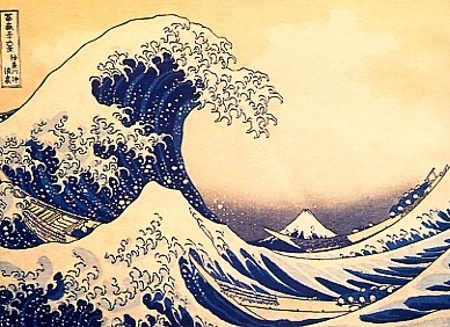 TSUNAMI is a Japanese term coming from : TSU meaning harbour and NAMI : wave. When a seism occurs in the sea, the vertical movements of the sea provoke, at the same time, water movements above. The moving masses of water will displace sideways in the shape of huge waves that will break up on the coast. Tsunamis are associated to the interaction of normal and opposite faults, whereas the thrust faults don’t cause many vertical movements. A violent seism at sea will generate a series of waves allowing the water to dissipate its energy. Its propagation can reach speeds ranging from 10 to 100 meters a second. In the open sea, the effect of a tsunami is not spectacular, the height of the waves are measured in centimetres, but near the continent, the sea bed is higher so the tsunami slows down. A sort of “ wave traffic jam” will increase the amplitude and form, when hitting the coast, a sea wall that can be as high as a few dozens meters. The tsunami will be all the more deadly since it hits a peopled coastline. But don’t worry, such a nightmare scenario concerns neither the French Riviera nor the Ponente Riviera. 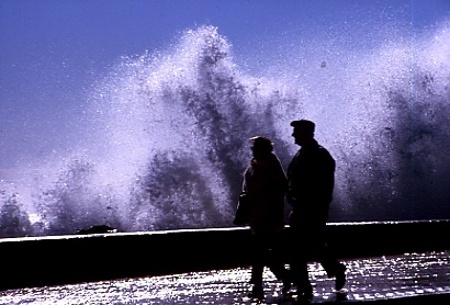 There’s no risk that Nice might be swept away and flooded by gigantic waves. Indeed, considering the topography of the sea beds, the rather small body of water in the Mediterranean, The average magnitude of the seisms ( 6.5 maximum is the alert level accepted by the Surveillance network of the Pacific)and considering at last the historical records of seisms, the amplitude and the devastating effects of tsunamis would be limited. You will find below the important events known up to now about the effects of tsunamis and tidal waves. In the documents known to this day no mention is made of any movement of the sea for the historical seisms of 1348 1489 1618 and 1644. The epicentres were located inland. 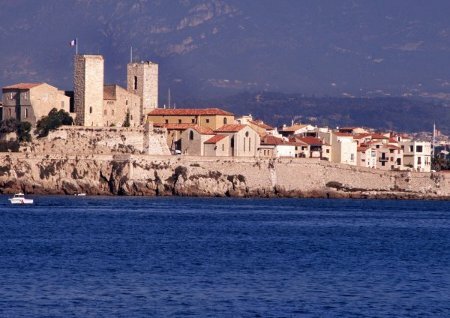 This seism mentioned an important movement of the sea in Antibes . According to O. Laurenti (an ancestor of mine, maybe) the sea arrived like a river, it floods many shops, then recedes, leaving the harbour almost dry.”According to Francesco Maggiol, the harbour of Villefranche subsided one “ pique” this term is repeated in many texts. Ludovic de Lantosque mentions a huge subsidence. Urbain Bosio, a historian, writes in his book : la province des A-M ( 1902) that in Nice, Villefranche and Monaco, a significant lowering of the sea was reported. He adds that it didn’t cause much damage in the coastline area.. But the author’s sources are not available. However, there is little chance that the seism in Nice caused a tsunami since the epicentre occurred inland at about 40 km from the coastline . I think that these movements of the sea were due to a submarine landslide caused by the seism. In the note quoted above, it is mentioned the story of Mr Barralis’s boat moored on the beach, was found the day after in the Serrat ‘s family house. It is said that a tidal wave threw it over the wall. In G.Mercalli’s report it is mentioned that in the outskirts of Arma di Taggia a few seconds before the seism, the sea withdrew and the boats bumped violently as if the keel had hit the sea bed. I have discovered at the Massena museum a note entitled ;” the earthquake of 29 December 1854 compared to previous ones”. That document ,published in 1855, was printed to be sold in aid of the sailors who died in the tidal wave of 20 January 1855. The unknown author makes it clear that the effects in Antibes were similar to the descriptions of the seism "nissart" in 1564 ( see above ). Researches in the Archives DPT allowed me to read a press article from ‘ the Avenir de Nice ‘of Sunday 21 January 1855. In the column : Local News, we can read that during the night of Friday ( in the Saturday paper ) at around 4 a.m , a violent sea storm terrified the population . 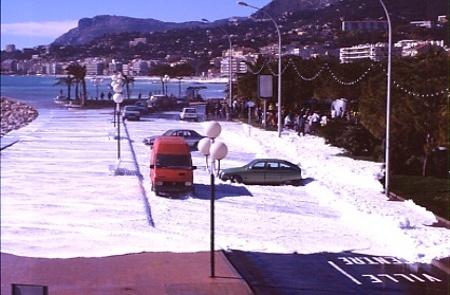 The waves quite instantly overwhelmed the shore and flooded the “ promenade des Anglais”. Pieces of wall collapsed, some parts of the road were swept away, the stone basin in one of the fountains of the Midi Boulevard was uplifted and broken, the hotel resort was seriously damaged. Twelve fishing boats equipped with fishing nets were smashed or swallowed, three fishing boats from Villefranche had also been lost. Finally the cross of the harbour set for the 1826 jubilee was knocked over. The fishermen suffered the most, that’s why a fund was started in aid of the victims. Among the people who suffered from the disaster, one was Montanari,a cabinet maker. The waves smashed into a warehouse behind his shop and destroyed the furniture and the wood inside. It is also mentioned that in the harbour the sea receded at one moment and the boats hit the sea bed. This tidal wave may have been caused by a submarine collapse because there is no mention of a seism on that day ‘ 20 January 1855). It’s necessary to add that this tidal wave occurred 22 days after the Ligurian seism of 1854. All along the coastline the main tremor caused movements of varied amplitude. According to the Monaco newspaper (1 March 1887) in Antibes ,after the first tremor, the sea suddenly withdrew, leaving the fishing boats and fish dry on the sand. Then, a two-metre high wave overflowed the beach and the sea level went back to normal. It is noted by Naudin that in Antibes, the sea level went down by 1 meter, exposing the sea bed on some places depending on its depth .Floating boats in the harbour hit the bottom a few seconds, then the sea rose again roughly to its normal level. That fact can only be explained by a sudden rising of the ground. In the “ Petit Niçois” of 28 February 1887, one can read that the water of the harbour lowered quickly by one meter so much that loaded ships touched the bottom and leaned quite a lot. That phenomenon, which in fact didn’t cause any damage, occurred three times in less than half an hour. This can be explained by the two after shocks which followed ten and twenty minutes after the main shock ; a rowing boat, with six sailors, after trailing a schooner, when going back toward the channel of the harbour, was caught by such a violent stream that it was thrown on to the mole of the lighthouse. The tsunami was equally observed, with varied amplitudes in Nice, Monaco ( 50 cm ) Ospedaletti ( 1 m ) Arma di Taggia, San Remo, Riva, San Stefano, Oneglia, Porto Mauricio (60 cm), Diano Marina (30 cm), Andorra, Alassio (1 m), Albenga, Loasso, Finalmarina, Savone, and Santa Margharita. In the review : Astronomie of the period, The people’s testimony at the cape Ferrat, gives some interesting precisions : “ this calm, heavy sea of a blue and yellow hue ; then all of a sudden it recedes and leaves the seaweed and the rocks bare 100 meters in length ; then it comes back with an upheaval power that can’t bear comparison with any wave. The movement was registered on the tide gauges of Genoa and Nice whereas nothing was registered in Marseilles. Bellottio’s observations on the power of the tsunami were recorded by G. Mercalli and Professor A. Issel. After the earthquake, dead fishes were found on San Remo,Savona, Nice, and Villefranche beaches. Some fishes belonged to rare species that generally live in the great depths of the sea. Many observations as regards the low level of the sea let us think of an upheaval of the ground. Some people in Beaulieu and Villefranche noticed that a few boats scraped the bottom in channels where formely the entrance was safe. Near Savona and Porto Maurizio harbours as well as on the coastline near Ventimiglia, rocks that had never been seen before, emerged from the water. Mercalli adds that at Loano , the fishermen assert that the sea went low around the mole where it is now possible to walk without getting one’s feet wet. In Genoa, a boat needing repairing was about to enter the careening dock when it was hindered by the receding of the waters of 35 cm. The same phenomenon occurred in the harbour of Savona, some barges from Marseilles couldn’t come to berth at their usual place. Another fact was mentioned : the captain of the steamship : Guadeloupe sailing from Genoa to Marseilles at 6.00 a.m felt two strong tremors as the ship had hit a rock. The captain had the engine slowed down to examine the hold. At around 8.00 a.m, the ship felt another tremor which was less violent. These tremors exactly correspond with the ones of the earthquake. In the review : L’Astronomie C. Flammarion points that vertical oscillations up and down were felt and that the water went low by one meter then returned to normal .He adds that several ships felt the tremor between genoa and Toulon. Some unexplained quakes preceded the catastrophe. In the reports of the Academie des sciences, Bouquet de la Grye describes the record of the tide gauge of Nice harbour ; this one shows a sudden upheavalof the ground followed by a slow, low movement. It appears that the sea returned to its normal level two hours later. Moreover, this phenomenon didn’t extend to Marseilles, the tide gauge of the harbour didn’t show any elevation. According to the same records of the : Académie des Sciences, A. Issel mentions this : The Genoa tide gauge clearly indicates the 1st tremor of the 23rd and the subsequent undulations of the sea but it didn’t indicate the raising of the sea bed reported by the press. It is true that the waters were very low. After the first tremor, a vertical receding of about 1 meter of the sea was observed, especially along the coastline at Porto Mauricio, Diano, Alassio, soon followed by a rising wave thatflooded the beach hitherto emerged.According to E. Charlon at Porto Mauricio ( Imperia ), a few minutes before the tremor, a small ship trying in vain to sail out of the harbour, was swirling and called for rescue. The sea went down by 30 cm. Several beaches flooded and a pier destroyed after a sea storm in Cannes. The raging sea was probably due to a breaker caused by a subsiding swell. The day before, storm disturbances had been hovering over the sea. A dozen of resort buildings on : la Croisette and the beach of the Midi were hit. This phenomenon had no relation whatsoever with the seism which took place 100km south of Monaco two days earlier. It is not easy to get some information on the catastrophe at Nice airport since the data are kept secret because of the potential consequences as regards insurances. The reports, for judicial reasons can’t be consulted for a period of 100 years. A few days before, heavy rains had fallen on the region. On October 16th 1979 at 1.57pm a part of the embankment platform disappeared into the sea. A few minutes before, after a relatively small lowering of the level of the sea, a tidal wave submerged the coastline and a wave,, between 2.5m and 3.5 m broke onto the beach of : la Salis in Antibes at 2.06 pm, killing one person. In the evening, at 6.45 pm a submarine cable located 75 km far from the shore is severed. Then at10.50 pm another cable isbroken, 105 km away. The embankment works were in the process at the moment of the accident. The ground was constantly pounded and compaction machines were crushing the materials. These embankments for a new dam were set not far from the river Var canyon and that river level was quite high. In addition, blocks from the airport were spotted 5 km away, 1 000 m deep in the sea. The hypothesis accepted by the DDE after the investigation, presumably was that a submarine sedimentary avalanche of approximately 150 million m3 occurred at the mouth of the Var. This one caused a tidal wave in Antibes. 21 May 2003 seism in Boumerdes in Algeria - Tsunami marine phenomenon in the harbour of : la Figueirette at Théoule-sur-mer. At Théoule, several small boats were tipped over by stronger than usual waves. According to the marine district chief of Théoule, this phenomenon occurred during the night of 21/22 May 2003. It started by the arrival of a heavy swell. As a consequence, the level of the sea rised rapidly then it receded so that the harbour was left partly dry. in : la Figueirette the water went low by 1.50 m in the docks, with strong entering and withdrawing streams. The damage assessed by the harbour team was limited to a few boats. In Antibes, yatchmen signalled heavy waves. A 1m recession was observed near Hyeres in the Var department. During the first days, it was difficult to get information about the arrival of the waves. However, a witness at sea on his boat on Wednesday 21st May indicated that, in the evening, the harbour started emptying at 10 pm, that is to say one hour and 16 mn after the seism. It was heard, some time later, that the waves had reached the Baleares islands after a propagation of about 20 to 30 minutes. The tide gauges of the SHOM registered that the waves reached Monaco at 8.30 standard time, that is to say 1h 46 mn later. 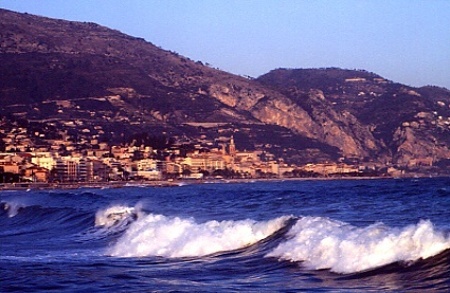 On the coastline of Monaco and Liguria the tsunami was 10 cm high. The subsequent oscillations lasted more than 24 hours. A small tidal wave occurred in Marseilles near the : Pointe rouge, the sea suddenly receded of 20 meters so that the level of the water was 50 cm lower for half an hour. A scientist of the tides in Marseilles explained that this tidal wave was caused by a landslide which occurred at about 15 km from the coastline a few minutes before the first wave. A lot of fear but little damage. The local documents don’t let us go back far in history. The accuracy of these data is, except for the 1887 seism, relatively unreliable as regards the nature of the phenomenon observed. In the 19th century three events occurred , two of which are the aftermath of a seism. It is probable that the seismic events in Liguria in 1831 and 1854 engendered movements of the sea, yet the documents available at that period don’t mention them. During the 20th century only two tidal waves , not related to a seismic activity, occurred : the first one in 1924 and the second one on October16 1979. We can presently establish a recurrence of two or three events per century, on the last two centuries basis. A surveillance of our coastline should be set up because for instance, during the seism of Boumerdes, from Monaco to Perpignan, no precise information on the arrival and significance of the waves was available.